And if I was, then everything I have experienced has allowed me to see now what I hadn’t seen before this day, that wonderful light in me. What illuminates behind my eyes is a vision, a dream that stimulates all of my senses. I marvel at the wonder of an enlightened world. I envision a peaceful and harmonious Earth with enough love and respect to join together as one country and one society. The light I see in front of me illuminates an Earth ready to discover freedom from disturbance, calm from war and violence, and each and everyone of us ready and willing to sign a treaty, agreeing to work on one single thing: peace. There is a distance between the light I see behind my eyes and the light I see in the distance. I keep reaching for the light. I keep extending my arms, but they don’t seem to reach. Is it the fear in me that stunts the growth of the extension of my arms? Is it fear that holds me back from participating in my own vision? The natural part of the light in me is restless; there is an energy that feels restricted and fidgety, and I am unable to relax. There is another dream I yearn to see. The constant ambition of my Soul sends thoughts, images, and sensations to the light behind my eyes, but the fear in my arms hold me back. I recognize the fear and I realize it is the same fear that holds back so many of us on this Earth, the same fright that keeps us from what we dream of most: peace. 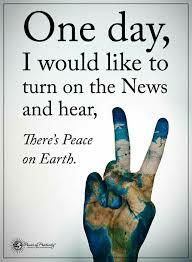 If not peace for the world, then at least peace for ourselves. I won’t give up on the light I see in me. I will work on the extension of my arms because once you dream a dream it never goes away, not if the Soul has anything to do with it. No dream is ever too big, not if it is infused with ambition, aspiration and hope, and most of all with love.